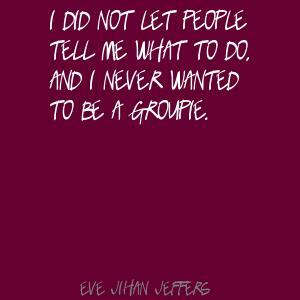 See the gallery for quotes by Eve Jihan Jeffers. You can to use those 8 images of quotes as a desktop wallpapers. I can't wait to have kids. I want so many. I want to adopt and have my own. I'm such a girly-girl! I don't know why people don't see that. My dream collaboration is with Lauryn Hill. Is that ever gonna' happen? Who knows! But there's still a lot I feel like musically I could do.